Health Walk - Llanover Park at Llanover Village Hall01633 644850work Walking RouteA mostly flat walk with one slope to the canal. The walk follows a woodland avenue and crosses areas of open parkland before reaching open countryside and the canal. 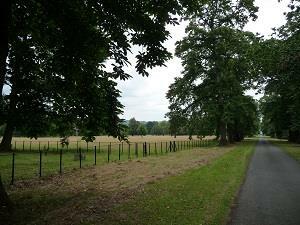 Points of interest include Llanover Park was used by American troops who trained here before the Normandy landings. A mostly flat walk with one slope to the canal. The walk follows a woodland avenue and crosses areas of open parkland before reaching open countryside and the canal. The estate was home to Lady Llanover - the Bee of Gwent - a fierce champion of Welsh language & culture and Lord Llanover - Benjamin Hall – oversaw the building of the Houses of Parliament and the great bell ‘Big Ben’ was named after him. St Bartholomew’s church dates from the 13th century.